This article was researched and written by Joe Hardman in 2015 to celebrate the centenary of this hidden and little-known building and is reproduced here with his permission. The following is a short history of Woodland Court and the people who have lived there pieced together from living memory and newspaper archives. Click here to find it on a map. She was born in Ireland in 1852 and died in 1928. In 1888 she married John Crosfield a soap manufacturer from Warrington, Lancs who was born in 1832 and died in 1901. It was after her husband’s death that Mrs. Crosfield had Woodland Court built in the Arts & Crafts style in 1914 by architect Harold Conybeare Trimnell ARIBA (1874 – 1958). Harold Trimnell married Elizabeth Wells in 1930 and lived at White Cliff, Woldingham, Caterham Valley. He designed 21 Arts & Crafts houses in Woldingham, Sussex. A key characteristic of Woldingham is the large number of late 19th and early 20th century architect-designed houses that were built on Gilford’s spacious plots. Leonard Stokes, Maurice Webb, Lawton Ford, Harold Trimnell, Alfred Cawthorne and Rupert Davison all designed substantial dignified houses in the Arts and Crafts style, with clay tile roofs, deep eaves, leaded glass windows and loggias, all set in large landscaped grounds. If John Crosfield had children by his first marriage, there is no mention of them in the newspaper article detailing his bequests. John and Gertrude were married in 1888 and he died in 1901, 13 years later. Gertrude Dickson was from Dublin, the sister of John Crosfield’s first wife. The census record for 1891 shows John and Gertrude living at Walton Lea, Runcorn with two sons, Joseph and George, three daughters and seven servants. The two sons would have been 36 and 47 respectively at the outbreak of the first world war: presumably too old to serve. Joseph John Crosfield went into the soap business and was married with family and living in Cheshire in 1911. There are three mentions of a George Crosfield with appropriate birth dates, travelling by sea to the USA. A newspaper article describes a George Crosfield dying in a bedroom fire in London. When Gertrude Crosfield died in July 1928 in Chesham Bois, the house and contents were sold by auction in Sept 1928 and subsequently bought by Joseph Henry Jacobs. He was born in 1869 and died in 1949 and was the son of Chapman Jacobs. In 25 Jan 1910 he married Gladys Evelyn Tuck (b.1885, d.1967) daughter of Sir Adolph Tuck, 1st Bt. He became a wealthy ship owner. 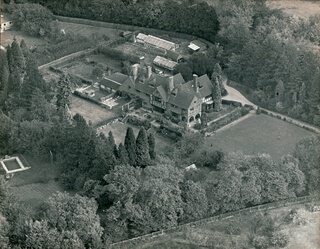 The Jacobs lived at Woodland Court approx 1928 to 1949. Also at 73 Portland Place, London. In 1938 Woodland Court had a house keeper Mrs. Hunt and four maids. The cook was Mrs. Moore, the groom Mr. Alder, under groom Mr. Youngman, chauffeur Mr. Harry Judd. Henry Jacobs had a cream Daimler and a black Rolls Royce. There were several gardeners (some say seven) under Mr. Steel who lived at Warren Cottages. Mr. Jacobs had two dairy farms and there was a dairy attached to the north end of the house. Joseph Jacobs died 1949 aged 81 leaving £1m. He left a house in Chesham Bois to his chauffeur Walter C Youngman and the remainder of his fortune in trust to his wife who died in 1967. Mrs. Jacobs must have sold Woodland Court soon after the death of Joseph Jacobs as it was in the possession of Roxy Trading Co. in 1951. The census record for 1911 does not list any children when she was 26 and he was 42. But a list of Chesham Bois residents that served in WWII noted on the October 1945 Service Voters list includes: Jacobs, John H, Woodland Court. There was also a daughter Joyce. On the death of Joseph Henry Jacobs, Woodland Court was purchased by the Roxy Trading Company, Kings Grove, Maidenhead. This company divided the main house into three and the single story ‘dairy’ outbuildings into a bungalow (No.4). No. 2 was sold to Ronald Colles on 30 July 1951 for £5,500. Ronald Colles sold No.2 Woodland Court to Joe and Daryl Ann Hardman on 28 Aug 1985. No.1 was owned by John Knowles who subsequently moved to No.4 with his daughter Betty and sold No.1 to Bernard O’Connell. In Jan 2008 the O’Connells built Bank House in their garden and sold No.1 to Charlie and Rachel Powter. In 1961 No.3 was owned by David Nisbett. Subsequently it was owned by Mrs. Monzani, the ballet teacher, who built a new bungalow Little Rushmore, over the air raid shelter next to the old tennis courts. She sold to Brigadier Rowley Mans who sold it by auction on 17 July 1973 and it was bought by Chris and Angela Brown. When Chris and Angela Brown divorced they sold to Alan and Sylvia Morris in 1987. Woodland Court had a gatehouse with stable and coach house, since demolished and replaced by two substantial new houses. The gatehouse was at one time owned by David and Gill Munrow. David Munrow was celebrated conductor and co-founder with Sir Christopher Hogwood of the Early Music Consort, which made over 50 recordings. Sir Christopher Hogwood went on to found the Academy of Ancient Music, which specializes in performances of Baroque and early Classical music using period instruments. David Munrow committed suicide in 1976 while suffering from depression. There are many rumours as to why. He used to overwork, and it appears from the original court records that he was deeply upset by the death of his father, and then, shortly after, his father-in-law. This appears to be key cause of his demise. Indeed, his only book is dedicated to both of them. On the day of his passing he, and his wife Gillian were intending to go to Venice. However, she found him hanging from the hayloft of their garage in Chesham Bois, Buckinghamshire. They had not lived in the area for long, and had previously had a home in St.Albans, Herts. Furthermore, Munrow had attempted suicide via a drug overdose in 1975. James Bowman his singer for his Consort lost his singing voice because of the shock of his death, and had to be re-trained. Many of the Woodland Court servants lived in the row of cottages called The Woodlands. Their history is unknown but they appear to pre-date Woodland Court as the deeds mention sales in 1910.